Rev. Joseph V. Corpora, C.S.C. The Catholic Church is the largest of the Christian churches in the nation, and more than half of the Catholics in the United States who are under the age of 25 are Latinos. Barring massive changes in birthrates and immigration, a majority of American Catholics will be Latinos by the year 2050. If the rise of Latino Catholics confronts the Catholic Church in America with a profound and tumultuous challenge, the University of Notre Dame’s Rev. Joseph V. Corpora, C.S.C., sees it as a blessing as well. “I think Latino Catholics might even be God’s last-ditch effort to keep the American Catholic Church truly catholic, sacramental and diverse,” he said. Father Corpora was speaking to the participants of the Adelante Conference, a gathering of 120 campus ministers from 43 colleges and universities nationwide hosted by Notre Dame’s Office of Campus Ministry June 3-6 to discuss how better to serve and engage Latino Catholic students. 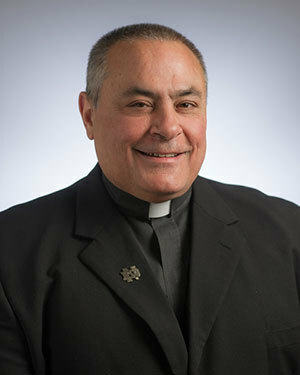 Father Corpora directs Catholic School Advantage, an initiative of Notre Dame’s Alliance for Catholic Education program to increase the percentage of Latino children enrolled in Catholic schools, and he also serves as associate director of Latino ministry at Notre Dame, where he lives among undergraduate students in Dillon Hall. His interest in Latino ministry is more than theoretical. Latino and Anglo alike, Holy Redeemer parishioners did indeed wish to talk about how they had come to be there. “Everyone has an immigration story,” Father Corpora said. “Whether the Fisher family immigrated to Portland from Norway in 1910 with stops in Minneapolis and Fargo along the way, or the Bautista family immigrated to Portland from Cuernavaca in 1998, everyone has an immigration story.” Simple storytelling over a common meal had wonderful effects on the parish community, and Father Corpora remembered them when he emigrated from Portland to Notre Dame. At the beginning of the 2013-2014 academic year, he had an idea. The pizza party Father Corpora hosted that night was the first of what have since come to be called “Notre Dame Story Nights.” There have been 12 such gatherings since then — four for freshmen, three for sophomores, three for juniors and two for seniors — and 111 students and four of Father Corpora’s colleagues on the Campus Ministry staff have participated. The campus ministers at the Notre Dame Adelante Conference had discussed how they might accompany Latino students and help them grow in faith, how they might welcome departed or lapsed Latino Catholics back into the Church, how they could support and challenge Latino students and others to grow in faith. In concluding remarks to the gathering, Father Corpora spoke of hopeful efforts in such ministry at Notre Dame, including the weekly celebration of Mass in Spanish and the annual Latino Freshman Retreat. Originally published by Michael O. Garvey at news.nd.edu on June 18, 2014.